Juk is a predominantly Korean porridge made of grains such as cooked rice, beans, sesame, and azuki beans. 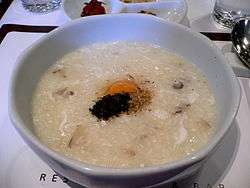 It is also a common food in other Eastern Asian countries under different names (such as jook, in Cantonese). Juk is often eaten warm in Korea, especially as a morning meal, but is now eaten at any time of the day. It is known to have nutritional benefits, and is considered to be beneficial to digestion because of its soft texture. It is a staple "get well" dish; a dish to eat when one is sick or recovering from bad health. Juk is also considered an ideal food for babies, and is sold commercially by many juk chain stores in South Korea. There are more than forty varieties of juk mentioned in old documents. The most general form of juk is simply called heen juk (흰죽, white juk), which is made from plain white rice. Being largely unflavored, it is served together with a number of more flavorful side dishes such as jeotgal, various types of kimchi, pickled cuttlefish, spicy octopus, and other side-dishes. Other varieties include different ingredients such as milk, vegetables, seafood, nuts and other grains. Jatjuk(잣죽) : rice is soaked and pine nuts are finely ground before being boiled in water. Omija eungi (오미자응이): Mung bean starch is added to boiled omija water and simmered. 1 2 An Illustrated Guide to Korean Culture - 233 traditional key words. Seoul: Hakgojae Publishing Co. 2002. pp. 20–21. ISBN 8985846981. Wikimedia Commons has media related to Juk.